The Amstel Arts Bridge serves as the newest cultural link within Amsterdam, a city where cultural capital is supported through social interaction, mobility, museums and collections, as well as the arts. As this site along the Amstel River is special because it exists between two extremely important arts-based destinations within the city landscape - Six Collection and the Hermitage Amsterdam - The Amstel Bridge manifests itself as an urban connection to create a fluid experience between the two existing collections. While making the link between two important destinations within the city, the bridge aspires to also become its own destination by developing a landscape of spaces, perceptual interpretations, and inspirations for the many art-forms practiced by the people of Amsterdam. 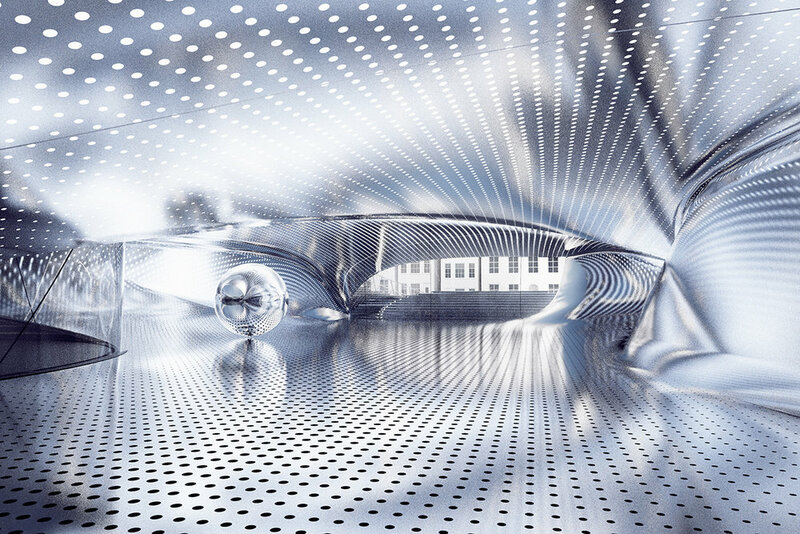 The idea of this art bridge is simple - it understands "art" as an infinite amount of creative and productive activities - a universal space materialized through three straightforward ideas. 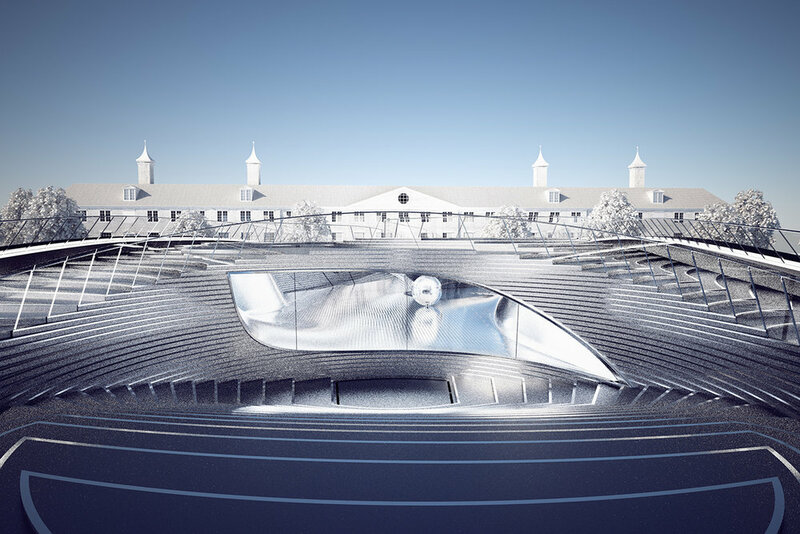 Site - As a fluid connection between Six Collection and the Hermitage Museum was a driving force of the bridge, the relation between both icons is not exactly axial. 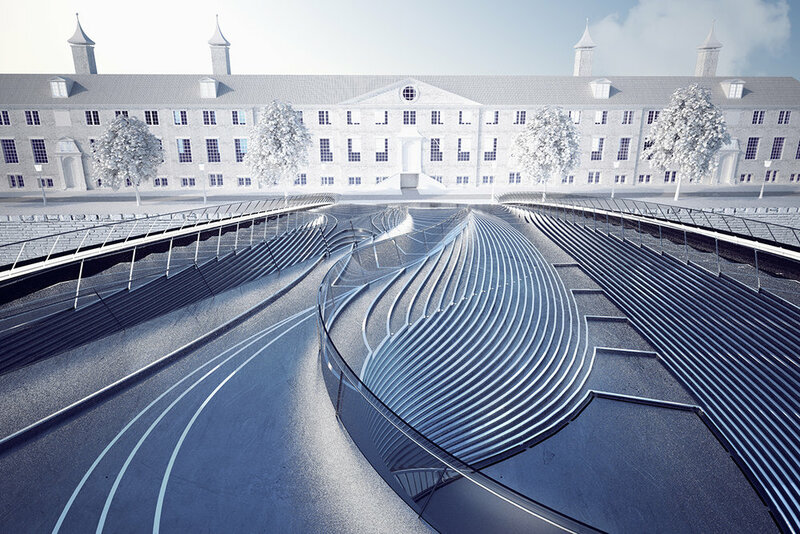 The bridge uses conjoining arcs to disguise the axial mis-alignments between the two cultural destinations adjacent to the site, and create a contiguous "Band-of-the-arts" between the Six Collection, Arts Bridge, and the Hermitage Amsterdam. The entire deck of the bridge is a traversable landscape with embedded pockets of space for smaller functions, all of which become elements for interaction and creativity. Space - Within the continuous landscape between the two adjacent cultural destinations, there are smaller sub-pockets which support different functions and art-forms. Space 1 lends itself as an amphitheater for speech or dance performances. The landscape alters into seating to support an audience looking to partake in public expression. Space 2 is the canvas zone, an enlarged flat plane within the landscape to ground easels and canvases for fine-arts such as painting. Space 3 is the heart of a bridge, an interiorized gallery for display of any art produced on the bridge. The walls are formed to refract many new visions of the art displayed, with the ultimate intention that re-appropriated perceptions yield new ideas. 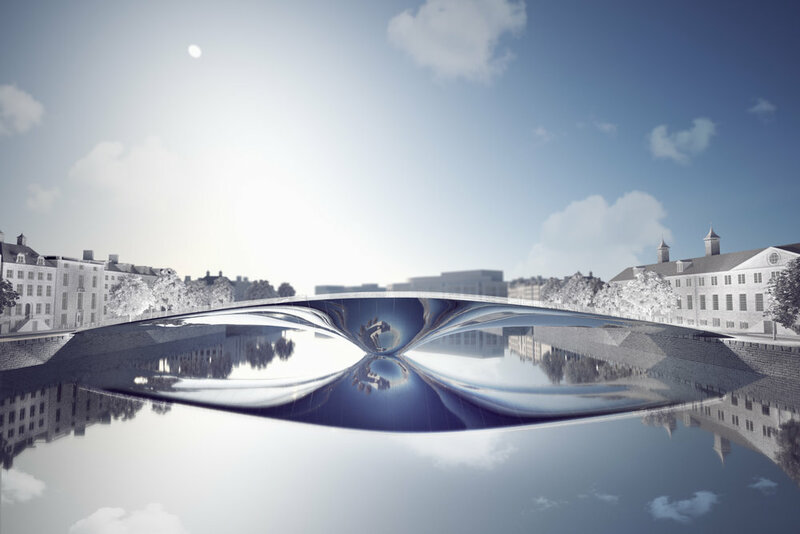 Materiality - The Amstel Arts Bridge is a concrete sub-structure clad in an assortment of glass and steel (both polished and matte). The palette of steel was born out of the bridge's desire to constantly refract perspectives and images of work into new ideas via visual and perceptual distortions. As the bridge is a universal destination for all in the city, it does not favor one specific user group either. Both those traversing over the bridge, and those traveling under the bridge are offered a menagerie of light, reflection, and contrast - pushing perceptions to their limits and towards new readings of old work. Through a site-specific opportunity (the necessity to connect two semi-axial urban icons) the bridge employs a repertoire of mass and materiality combined together to create a new urban icon not only enhancing the existing site, but contributing to new cultures and creations in a city where these notions are celebrated.